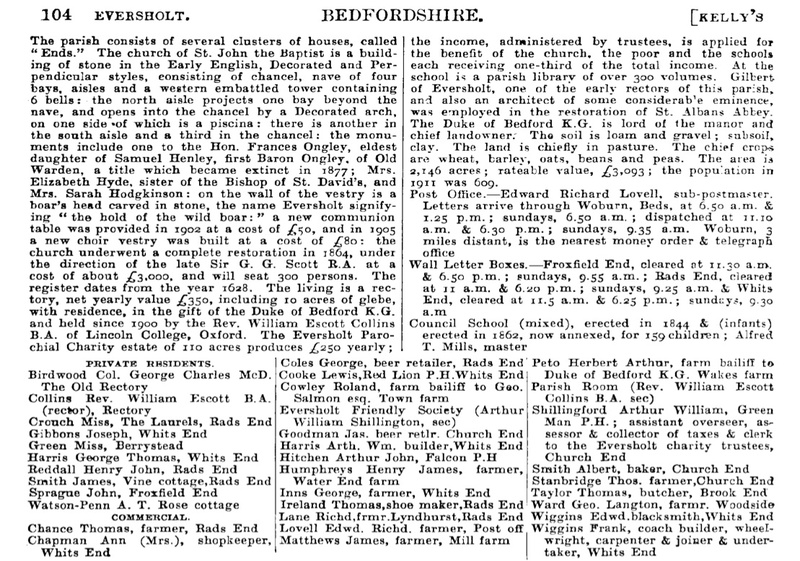 Kelly’s Directory for bedfordshire of 1914 has this entry for Eversholt. EVERSHOLT is a parish 2½ miles east from Woburn, on the borders of the park, about 4 south from Ridgmont station on the Bedford and Bletchley branch of the North Western railway, about 3½ south-west from Flitwick station on the main lane of the Midland railway, 6 north-east from Ampthill and 14 south-west from Bedford, in the Southern division of the county, hundred of Manshead, petty sessional division of Woburn, county court district and union of Ampthill, rural deanery of Fleete, archdeaconry of Bedford and St Albans diocese. 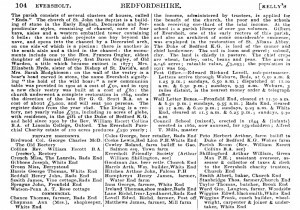 The parish consists of several clusters of houses, called “Ends.” The church of St. John the Baptist is a building of stone in the Early English, Decorated and Perpendicular styles, consisting of chancel, nave of four bays, aisles and a western embattled tower containing 6 bells: the north aisle projects one bay beyond the nave, and opens into the chancel by a Decorated arch, on one side of which is a piscina: there is another in the south aisle and a third in the chancel: the monuments include one to the Hon. Frances Ongley, eldest daughter of Samuel Henley, first Baron Ongley, of Old Warden, a title which became extinct in 1877; Mrs. Elizabeth Hyde, sister of the Bishop of St. David’s, and Mrs. Sarah Hodgkinson : on the wall of the vestry is a boar’s head carved in stone, the name Eversholt signifying “the hold of the wild boar”: a new communion table was provided in 1902 at a cost of £50, and in 1905 a new choir vestry was built at a cost of £80: the church underwent a complete restoration in 1864, under the direction of the late Sir G. G. Scott R.A. at a cost of about £3,000, and will seat 300 persons. The register dates from the year 1628. The living is a rectory, net yearly value £350, including 10 acres of glebe, with residence, in the gift of the Duke of Bedford and held since 1900 by the Rev. William Escott Collins B.A. of Lincoln College, Oxford. The Eversholt Parochial Charity estate of 110 acres, produces £250 yearly; the income, administered by trustees, is applied for the benefit of the church, the poor and the schools each receiving one-third of the total income. There is a reading room managed by a committee of 10 members, the rector being president; at the school is a parish library of over 300 volumes. Gilbert of Eversholt, one of the early rectors of this parish, and also an architect of some considerable eminence, was employed in the restoration of St. Albans Abbey. The Duke of Bedford K.G. is lord of the manor and chief landowner. The soil is loam and gravel; subsoil, clay. The land is chiefly in pasture. The chief crops are wheat, barley, oats, beans and peas. The area is 2,146 acres; rateable value, £3,093 ; the population in 1911 was 609. Hitchin Arthur John, Falcon P.H.